“A nation can survive its fools, and even the ambitious. But it cannot survive treason from within. An enemy at the gates is less formidable, for he is known and carries his banner openly. But the traitor moves amongst those within the gate freely, his sly whispers rustling through all the alleys, heard in the very halls of government itself.” – Roman Senator Marcus Tullius Cicero, 40 B.C. This quotation is said to be a favorite among U.S. counterintelligence officers. Although the behavior of the so-called migrant caravan is on display for all to see, the Democrats and their news media propagandists continue their lies and deceit over illegal immigration and law-breakers’ supporters. U.S. Congresswoman Pramila Jayapal (D-Wash.) joined the migrant caravan stranded in Tijuana over the weekend, according to her office’s latest press statement. While there, she blamed President Donald Trump for manufacturing the crisis of asylum seekers wishing access to the United States. Jayapal, a leader of the Congressional Progressive Caucus and one of the most outspoken critics of Trump’s immigration policies, visited several shelters where members of a migrant “caravan” are being housed as they wait for their claims to be processed amid large backlogs. The border crossing linking Tijuana with San Diego saw major clashes last weekend between asylum seekers trying to enter the U.S. and border guards who blocked their way. “I was able to successfully assist 5 asylum seekers – 2 unaccompanied minors, a mother and her 9-year-old child, and a young man with a serious medical condition – into the United States,” she wrote in a tweet. The five people she assisted were initially denied entry. “Initially they were denied, in violation of U.S. and international law, but I was able to intervene and ensure that they could simply present themselves for asylum in the United States,” she said in a follow-up tweet. Before she went to the border, Jayapal blasted Trump for “lying” about the caravan and creating a crisis for his own political benefit. 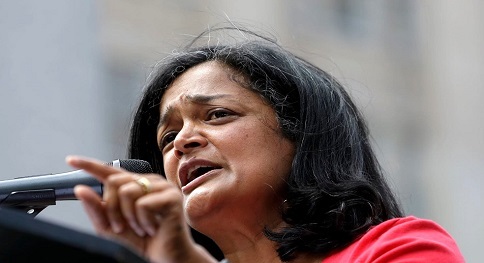 U.S. Rep. Pramila Jayapal is one example of Democrats supporting the illegal aliens threatening U.S. sovereignty are more concerned with law breakers than the rights of U.S. citizens. The U.S. Border Patrol agents assigned to the southwestern border region in past administrations were permitted — even ordered — to use non-lethal “impact weapons” when confronted by large mobs of aggressive, violence prone non-authorized foreigners. That includes the agents serving during the administration of the “sainted” President Barack Obama. In fact, most Americans weren’t even aware of incidents that created the need for physical force by federal law enforcement at this nation’s borderline and the news media rarely covered such non-lethal use-of force to fend-off rock and debris throwing immigrants. During one incident that occurred when the Commander in Chief was President George W. Bush, a Homeland Security Department report described a “border incursion” by fully-armed suspects who entered the U.S. without permission or authorization. When those invaders began shooting from the Mexican side of the border, and they kept on firing their lethal weapons while they came onto U.S. soil, the National Guard troops assigned to help control the porous border region at that location found themselves without any rules of engagement or without any real military weapons to thwart the attack from the unknown intruders. During that time in 2006, under President George W. Bush, 6,000 National Guard soldiers were sent to the U.S.-Mexican border in Arizona, California, New Mexico and Texas. However, Guard members were prohibited from enforcing the immigration laws. Their missions included engineering, aviation surveillance, and other support. Unfortunately, it was a story that should have embarrassed all American citizens: American soldiers had to hastily retreat and telephone the cops. But Americans weren’t embarrassed because the news media ignored this and other stories of “invaders” forcing American service men and women to run for their lives. At least not until President Donald Trump, following his own agenda that includes transparency, authorized the men and women serving at the border with Mexico to use less-than-deadly physical force, which they did only to be lambasted by the Democratic Party’s officeholders, so-called civil-rights leaders and political commentators and news anchors from most group-think publications and news outlets. Many Democrats are opposed to law enforcement officers who protect them from criminals and terrorists, but those Democrats are more concerned with the rights of criminals and terrorists than the rights of American citizens. When the agents used tear gas to stop migrants as they rushed the border, the media condemned the use of tear gas against “innocent” people. One news report featured a woman who was particularly outraged against Trump. “What is now coming out is that under President Obama tear gas was used against unruly migrants,” said frequent commentator and writer, Capt. Vincent Carnova. “The tear gas used on migrants at the U.S.-Mexico border at the weekend, which prompted criticism of President Trump, was also used almost 80 times under the Obama administration, according to Homeland Security data,” he added. 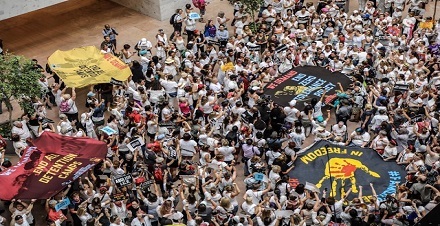 Democratic lawmakers and immigrant rights groups blasted the tactics of border agents. McAleenan said hundreds – perhaps more than 1,000 – people attempted to rush vehicle lanes at the San Ysidro crossing. Mexican authorities estimated the crowd at 500. The chaos followed what began as a peaceful march to appeal for the U.S. to speed processing of asylum claims. It appears no one complained when tear gas was used by Obama just a few years ago during the Obama administration. But once Trump was elected president, suddenly they changed their song and began to advocate “immigrant rights.” It seems that everyone came down with political amnesia in 2016. When Trump continued the policies of his predecessors, he was condemned for it. This is a clear case of political hypocrisy. But then, what’s new? I am former U.S. Customs and worked the U.S.-Mexican Border for 15 years and I also reported corruption at the highest levels while nothing was being done to investigate. 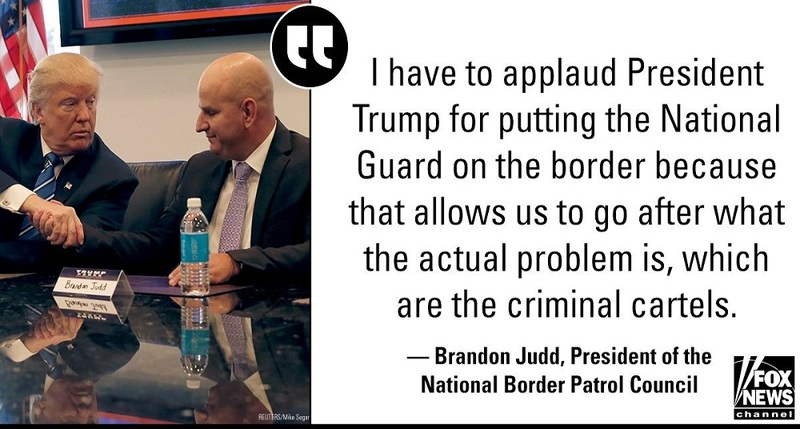 The Democrats will LIE and they do NOT have any concerns for the “Safety” of our Customs Immigration or Border Patrol officials when they are assaulted by Fully ARMED Mexican Cartels or Mexican Rogue Military with Fully Automatic weapons. There has been an average of over 125 “incursions” into the U.S. by “Armed” Drug escorts and even at least one Mexican Military Helicopter that Fired upon U.S. Border Patrol marked units inside U.S. Territory by about 2-5 miles which is in and of itself and “Act of War” and violation of the Treaty of Guadalupe-Hidalgo 1848. We need “Armed Military in between the P.O.E.’s(Port of Entry) to assist U.S. Border Patrol and U.S. Customs(CBP) or DHS. We still need help with National Security and it appears No ONE is listening. I’ve already notified the White House for the past 24 months and still no follow up calls. Everyone has been notified….I mean Everyone!